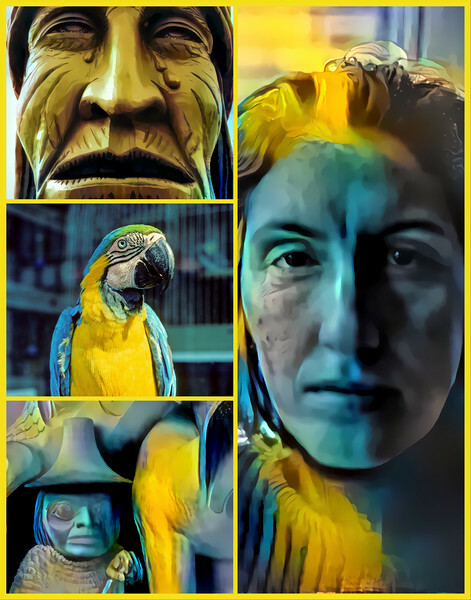 The Deep Dream Generator is a great tool for harmonizing colors. It applies the colors and textures of a “style image” to a target image. This is supposed to transfer artistic style. It’s debatable that “artistic style”, whatever that is, is transferred but colors and textures are sometimes used in useful and appealing ways. This collage was created by using the parrot as the style and the other images as targets. The colors mesh well yielding a final composite that amuses me more than any of its parts.